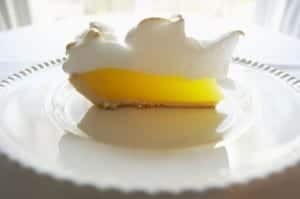 Home » Dessert Recipes » Lemon Meringue Pie – you can make lucious lemon pie at home. Lemon Meringue Pie – you can make lucious lemon pie at home. Lemon Meringue Pie is a light and refreshing pie. This is my Grandmother’s recipe. She was known for being a wonderful pie maker. I dearly miss her pies. This recipe is by Ethel Eynard. Jefferson City, MO. 1998. You can make luscious lemon pie at home. Mix sugar, cornstarch in saucepan. Slowly stir in water. Stir constantly over moderate heat until mixture thickens and boils. Boil 1 minute. Slowly stir half of the mixture into egg yolks, and then beat into hot mixture in saucepan. Boil 1 minute longer, stirring constantly. Take from heat. Stir until smooth. Blend in butter, lemon juices, and rind. Pour into a baked pie shell. Make a meringue of 3 egg whites 1/4 teaspoon Cream of tartar, and 6 tablespoons of sugar. Spread over filling, sealing to the edge. Bake 8 to 10 minutes until delicately browned. Cool at room temperature away from drafts. My grandmother made a great Lemon Meringue pie this one comes really close to hers! Loved it!